From the co-creator of Age of Empires, Brian Sullivan, comes an all-new action role-playing game set in the mythical worlds of ancient and . The Titans, gods before the gods, have escaped from their eternal prison to wreak havoc on the world. In this titanic struggle between old and new gods it is the heroes of humankind who will ultimately determine the fate of all existence. The player quests throughout the ancient world in a race to uncover the secrets needed to once again imprison these ancient gods. Journeying to fabled locations such as the Parthenon, the maze at Knossos, the Great Pyramids, and the Hanging Gardens of Babylon , the player will have to overcome terrifying monsters and mythical beasts. 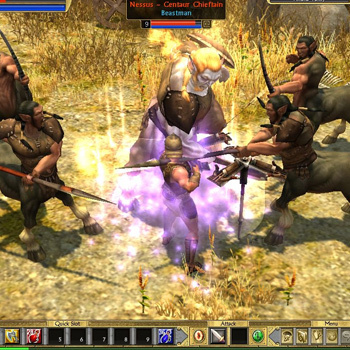 A flexible class system allows almost limitless ways for the player to develop their character. Skills can be customized in many ways, and never become obsolete.